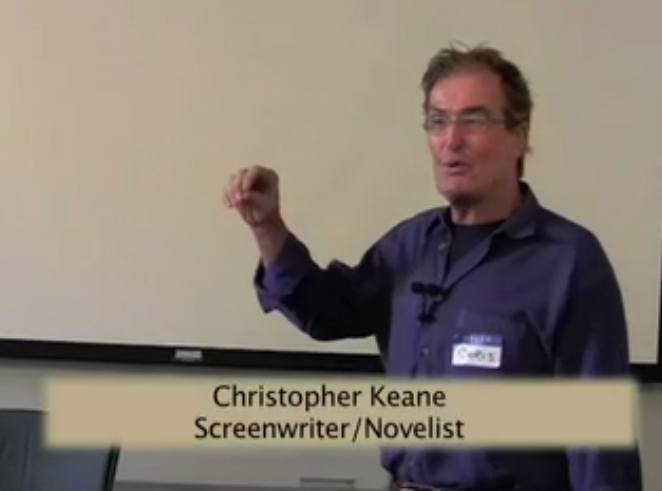 Chris Keane was the starting point for my journey into the world of narrative fiction. In October of 1989, when I was an utterly movie-clueless professor of marine biology at the University of New Hampshire, I began developing an interest in feature filmmaking. Back then there existed in Boston an amazing (but now gone) resource called the Boston Film and Video Foundation which was a cooperative that hosted workshops and provided resources to struggling filmmakers. I took a couple of workshops there and heard everyone buzzing about Christopher Keane’s Weekend Screenwriting Workshop. Without a clue of what it might consist of, I just blindly signed up, paid my $200, and showed up early Saturday morning for two very long days of lectures and exercise by the man. It was truly amazing. Best workshop ever. And when I headed off to USC Cinema School in 1994 I did the math — if I learned that much in a two day workshop, imagine how much I would learn in 3 years. But last year I flashed back and realized there was never another learning experience as great. Part of it probably had to do with my mind being a blank slate, but most of it had to do with Chris being an outstanding instructor. Last March I tracked him down, twenty years later, and we team taught a workshop on storytelling at The Monterey Institute for International Studies. He’s tremendous and the students loved him. 1) What is your favorite science-related movie? 2) Why is storytelling of importance to the world of science? Storytelling provides a context. Scientific research papers are dry — I know because I’m writing a novel that involves a neurophysiologist — so I’ve been taking a neurophysiology class at Harvard and reading research papers. Scientists get lost in their information and end up creating data stampedes. But the professor teaching this course I’m taking is one of the very best instructors I’ve ever had. What he does — he’s like Woody Allen — he brings a personality to it and tells stories that are a way of understanding what, without stories, would be generally incomprehensible to anyone without years of study. Another aspect has to do with funders. People who fund projects need stories. As one scientist told me, “No story, no money.” Funders get tired of reading dull technobabble. A story helps them make sense of what is being proposed. The scientists I’m talking with — they use a thing called the A.P.S. form (American Physical Society form for authors) to write their manuscripts, and that’s okay to a point, but they get swallowed up by that sort of thinking and make the science difficult to comprehend. The younger faculty are a mixed bag. The older faculty, with more time and education under their belts, are more flexible. They provide wonderful metaphorical language and context that make things more relatable. 3) If a scientist and a non-scientist were both in an earthquake would they tell the same story? The scientist would look at the barometric pressure, the wind speed — a “facts only account.” The non-scientist would talk about a family that lived under a bridge and what this earthquake did to them. It’s like TV where they talk about “the emotional tug.” They want to see the human condition. After reading two paragraphs by a scientist you don’t want any more unless you’re a robot. But if the accounts have some humanity in them you can follow them and want more. 4) Is storytelling of value in non-fiction? Yes, of course. I wrote “The Hunter,” which was a non-fiction book. What I did was to take this man’s life, who was a bounty hunter but also a classical music officianado, a life master in bridge. He had two degrees from Berkeley, and he chased bail jumpers around and brought them back, dead or alive. If I had written this book without the storytelling aspects it would have been rejected by every publisher in the universe. Without storytelling I would have listed every detail of everything that happened in his life, much as a scientist might do. But with storytelling, what I did was concentrate on six months of his life which sort of encapsulated his entire life itself. These six months brought in not only what was happening in his life in the present but also how he got there. A good example of the role of storytelling in non-fiction is the book, “Into Thin Air,” about the climbing of Mt. Everest. All the details a scientist might want are there in the book, but in the middle of the details is this human being, struggling against the mountain, the cold, the setbacks. Without that human condition in there, without that story of the human struggle, there’s little for the reader to relate to. Otherwise we might as well be talking about the mountain. 5) Can a good story lack humor and emotion? Nope. No. Never. And … scene!